The cash out feature (often called cash in) is one of the most important feature a bookmaker should offer to his customers. It basically gives the opportunity to request a return (positive or negative) before the event or events have finished. 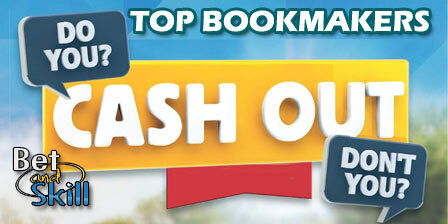 In this article we highlight the top online bookmakers offering the cash-out feature! 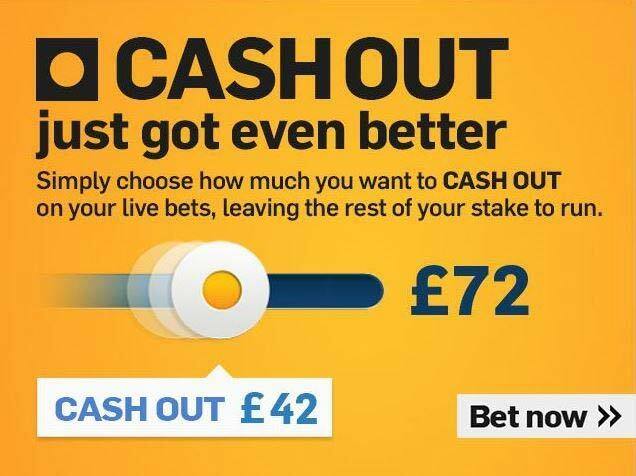 Betfair was the first online operator to introduce the “Cash Out” option on their betting exchange. Betfair has recently stated that cash out betting was the second most cited reason for joining their sportsbook and that they had completed over 20 million cash outs last year. They have recnetly introduced the partial cash-out feature! You can also use Cash Out to cash out on accumulators you may have running, also on horse racing! Bet365 has been the first online bookmaker to introduce a partial cash-out system within its sports betting platform. An amazing feature that will enable punters to cash out a portion of their active bet while leaving the remaining amount open. The potential returns and remaining stake are displayed on the Cash Out button, where you can choose how much of your bet to Cash Out and click to confirm your choice. In order to use the Cash Out feature on your mobile or tablet – simply select the My Bets section from the top of the page and visit the Cash Out tab to show your eligible bets. William Hill was only offerings their "cash in my bet" service for football bets and this feature applies to match betting markets (90 minutes) and in-play markets. Anyway, they have added many events to their 'cashoutable' sports. Horse racing, football baseball, basketball, boxing, cricket, darts, golf, snooker, rugby union and tennis bets, including In-Play and multiples bets. You can now Cash In outright selections (tournament winner), for a range of sports. To access your cash out bets you simply need to find your open or unsettled bets and you will be able to see a cash out button along with the current cash out price. Skybet are currently only offering the cash out feature for a selection of football betting markets and for mobile customers. They have packaged it in alongside some other service. The so called Sky Bet Tracker includes three tools - cash out, bet status and match stats. Hence, they bring live football stats, bet status and the ability to cash out early together in one place. Join Skybet now - get your weekly free bets! Coral offer cash out betting on selected football matches on the match result market only, for singles and accumulators. You can Cash Out Pre Match or In Play Singles and Multiple bets at any time after bet placement, when an offer is available. When a Cash Out offer changes from Orange to Gold, your bet is in profit. At present Coral do not offer Cash Out My Bet on Horse Racing markets. 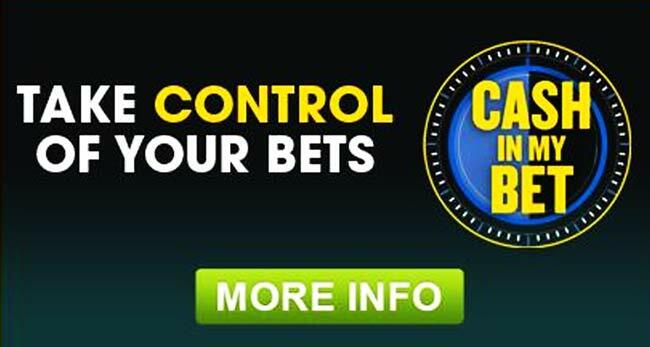 Join Coral Sportsbook here - big free bets and bonuses for you! PADDYPOWER CASH OUT The Irish bookie Paddy Power frequently offers cash-out options on the main sports events. They have a quick browsing function through their site that will show you exactly the markets you can cash out on, as indicated by the cash out logo. Paddy Power now offers Cash Out on multiple bets across all sports. There is a slight delay of a few seconds from clicking the cash out button to the funds appearing in your account. This is to ensure that they can react to markets that have altered before they have had time to recalculate the odds. Get your £50 free bet when you join Paddy Power! Cashing out can be done in one of two ways. The first is by clicking the ‘My Account’ at the top of the home page then clicking the Cash Out button. Alternatively you can just click the Cash out button from the left sidebar to be taken to the Cash Out ‘hub’. The popular Scandinavian bookmaker Unibet also offers the cash-out option, although they call this feature “Cash-In” instead of Cash-Out, but it works on the exact same principle. They only offer it for single live bets, so no accumulators. Join Unibet and claim your exclusive free bet now! At 888sport the Cash Out (called Cash In) option is available on most sports in-play markets. Whenever you do choose to click the button CASH IN you will be guaranteed the same returns no matter the ultimate outcome of the bet, plus the money will be delivered to your account immediately. One click and your bet has ended! Register a new account with 888sport! Betfred CashOut is available on selected football and golf markets and on both single and each-way multiples on horse racing pre-play, in-play, and between legs! Available on UK and Irish racing. Join Betfred and get your free bet now! "Top Cash Out Betting Sites"